Do Goats Need Baking Soda? When I got started with goats in 2002 it was common practice for goat owners to have baking soda available free choice. The logic is that baking soda is a rumen buffer. If a goat’s rumen pH gets a little off, they can self medicate by licking up a little baking soda. It would be like you taking an antacid if you got indigestion. Recently, however, the practice of free choice baking soda has been in decline as people have learned that goats produce their own bicarbonate. If they make their own, we don’t need to provide it for them — right? Not so fast! Like most things with goats, it’s not that simple. There is no one-size-fits-all answer for baking soda. 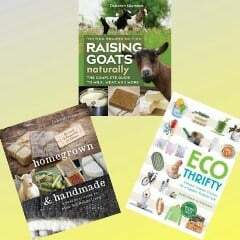 Why do goats need baking soda — or not? If your goats are on pasture and receive no grain, they probably don’t need baking soda. Goats produce their own bicarbonate when they’re chewing. Browse, weeds, and grass require a lot of chewing. So goat produce plenty of bicarbonate to help with digestion when they’re eating those foods. However, hay pellets and grain require very little chewing, which means goats will produce less bicarbonate when eating those foods. In fact, I’ve had a couple of grain hogs that seem to inhale grain with almost no chewing at all. Those goats would be most at risk for a rumen upset when baking soda is not available. Too much grain will also upset the rumen and throw off the pH balance. If there is zero risk of your goats ever breaking into the chicken grain or other grain bin, then they are less likely to wind up needing baking soda. But this is not always an easy task for new goat owners — or even experienced goat owners. In our early years with goats, they figured out so many ways to get to the chicken grain. We kept thinking that we had goat-proofed it, but they proved us wrong more times than I can remember. Since we had free-choice baking soda available, they were always able to self-medicate, and the worst thing we ever had to deal with was a little diarrhea. I’ll never forget the time a few years ago that we went outside one morning to find the door to the milking parlor open, the lid off the grain bin, and goat poop everywhere. If they had done that the previous night shortly after milking, and if they had not had baking soda available free choice, the pH of their rumens could have been thrown off badly and some goats could have been very ill before we even came outside in the morning to discover what had happened. But some goats are far more troublesome than mine. In a published case study, 42 sheep and goats were treated with sodium bicarbonate after consuming large amounts of apples, cooked rice, turnips, and chapatti (a type of bread). All of the animals except two recovered fully. In another study where they purposely fed enough grain to make goats sick, there was a one hundred percent mortality rate in those that did not receive baking soda. If you have baking soda available free choice, you may find that it disappears faster at some times than at others. You may go days or weeks with little to no baking soda disappearing — and that’s fine. In fact, that’s great! It means that your goats haven’t needed any baking soda. There is no need to force baking soda on them, so don’t sprinkle it on their grain or anything like that. That would be like you taking an antacid after every meal. If you really need an antacid after every meal — and if your goats do go through baking soda really fast — it means some dietary changes would probably be beneficial. In fact, because they feed an unnaturally high level of grain in cattle feedlots, baking soda is delivered in semis to keep the cattle from suffering from chronic acidosis. Will baking soda consumption reduce mineral consumption? Because sodium bicarbonate is salty, some people worry that it will decrease their goats’ mineral consumption, resulting in a mineral deficiency. When searching for research on sodium bicarbonate and goats, I did not come across any controlled studies where they tested this theory. This theory doesn’t pan out in my own herd as my bucks get no baking soda, yet they’ve had more problems with mineral deficiencies than my does. In studies where they tested goats’ ability to differentiate between various supplements, they found that goats depend on taste to be able to tell the difference between different minerals. That’s why you should not have multiple minerals that have salt as a carrier. However, baking soda is not simply salt, and it does taste different than salt. That may explain why providing free choice baking soda does not seem to affect mineral consumption in most herds. Are there other benefits of providing baking soda? In one study, they fed goats a diet supplemented with extruded soybeans and either 0 or 1% sodium bicarbonate in the diet by weight. In the group that had the sodium bicarbonate added, milk fat content and fat yield were increased, as well as the rumen pH. This doesn’t necessarily mean that baking soda will increase butterfat in all diets, but it is interesting to note that result in this particular study. 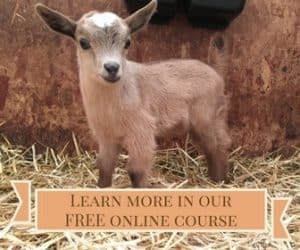 What’s right for your farm and your goats? Think about how all of the above information applies to your farm. The answer to this question may even vary from one set of goats to another on the same farm. For example, our bucks get no grain, so they get no baking soda. On the rare occasion when we’ve fed them a little grain during breeding season because they were losing weight, we provided baking soda for them — especially because they’re not used to having grain at all. Our milkers have it available at all times because they eat grain on the milk stand twice a day. If you have a pasture based meat goat operation, your decision will probably be different than someone who has dairy goats being fed concentrates for higher milk production. But by understanding the logic and the research behind the use of baking soda, as well as knowing your own goals and feeding regimen, you can find the baking soda solution(s) that works best for your herd. Thank you so much for this information. I was told to offer free choice BS when I brought goats home 10 months ago. Then someone said that was wrong because they produced their own and they would not consume as much mineral. I hesitantly removed baking soda, even though we’ve had bloat once due to a grain hog. I appreciate you providing more in depth information and diet comparisons. I am definitely putting free choice baking soda out now. Sunday we went to feed and one of our does seemed off. So a couple hours later we checked on her again and she was foaming at the mouth. We offered her baking soda and she ate 2 mouths full and we got her to burp and rushed at 7 pm to U of I. Found out she had grain overload or Acidosis. They were able to pump her stomach, found no “bugs” in her rumen so she got a transplant from a cow. She is doing great now, but being new at this is terrifying . Yikes! How scary! That’s exactly the scenario I’m talking about. I’m sure our goats have been saved multiple times by free choice baking soda. Thanks for the advice, we will be gone for a week or more and someone else will be caring for the animals, if by accident the grain area doesn’t get locked back up I could see quite the goat party with the rabbit feed and oats. I am going to put out some baking soda! There’s a scenario I had not thought of — only making it available when you’re gone, just in case. How much of baking soda do you give to each goat with bloatedness and how? If you have it available free choice, they can eat as much as they want. If they are so sick they won’t touch it, you can mix a teaspoon of baking soda with a little water and use a syringe (NO needle) to squirt it down their throat. An ounce of cooking oil (vegetable oil, olive oil, etc) also works for drenching a goat with bloat. Hi there, how do you administer the baking powder? Through water solution or just as dry baking soda? It is NOT baking powder. That includes other ingredients. You want BAKING SODA, which is 100% sodium bicarbonate. You do not administer it. You leave it out free choice in a feeder that is attached to the wall just like a free-choice mineral feeder. The goats only take as much as they want when they want it. Some may never touch it, and that’s great. I’m sorry I don’t know how you can unsubscribe from comments, and I don’t have a tech person who works for me. I’m sorry you are receiving four emails for each notification! That’s some kind of hiccup!